DIY: Cute Clay Pot Reindeer! Are you looking for a Christmas gift that comes from the heart but doesn't cost a fortune? Why don't you and the kids put together some of these adorable clay pot reindeer. You can fill them with chocolate or other treats and give them as gifts to just about anybody. They are inexpensive to make, and easy too. Plus they turn out so adorable that you may end up keeping one for yourself. So these are pretty fun and simple to make with the kids, but to save you some mess I would paint the clay pots brown before you get the kids involved. From personal experience, it is always best to do the bigger paint jobs yourself while the kids are sleeping so that they don't walk in and want to help out anyway. Step 1: Paint all of your clay pots to your desired shade of brown. Let dry for at least two hours. Step 2: While your pots are drying, you can prepare the rest of the items needed so that the craft at hand is as simple as possible for the kids. You are going to want to cut out antler shapes using the cardboard. Then trace that shape onto wrapping paper to make the antlers look festive. Cut out the wrapping paper and glue it to your cardboard antlers. You can add small bells to them as well. Step 4: Time to get the kids involved! Use the white paint to paint on your eyes, and use the black paint to add the pupil to the reindeer eyes. You can also use the black paint to put on eyelashes, freckles, whiskers or whatever you desire really. In this same step you can glue on the antlers and the pom pom nose. Be sure to make at least on Rudolph using a red pom pom. If you want a female reindeer, you can glue on some ribbon or a bow even. Step 5: Line each pot with tissue paper in a festive colour, and fill each pot with chocolate or other treats that you know your giftees enjoy. Voila! 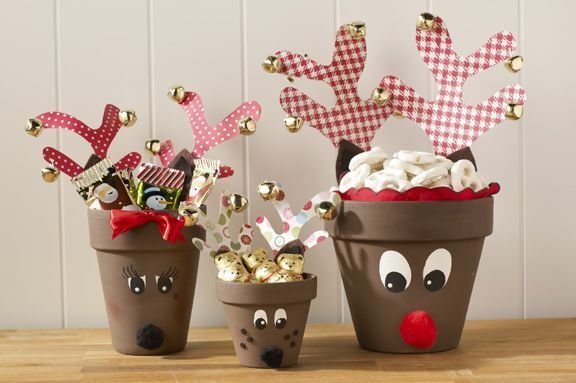 You have yourself some adorable, custom reindeer pots full of goodies to give as gifts this Christmas. Plus the kids will be super proud that they were able to help out. Moosers, do you prefer to buy or make Christmas gifts for your friends and family?